Chess Online over 10,000 downloads! Dear all, Chess Online has reached 10,000 downloads today. Thank you for playing my games! One of the players Filippo from Italy reported that since the new update the in-game touching mechanism didn’t work on his HTC Tatto phone (240×320). I looked into the problem and found it was because the hidden ads blocking the game board. After a quick fix to the problem, I was thinking why not adding supports to all kinds of screen sizes? So here it is. The new versions for 2 of the games can now support low/medium/high dpi screen densities and display contents according to screen sizes. Here are some screen shots. There are also some small fixes and features added to the updates. Enjoy. Chess Online 5.1: En passant finally! En passant is a special capture made immediately after a player moves a pawn two squares forward from its starting position, and an opposing pawn could have captured it as if it had moved only one square forward. In this situation, the opposing pawn may capture the pawn as if taking it “as it passes” through the first square. The resulting position is the same as if the pawn had only moved one square forward and the opposing pawn had captured normally. The en passant capture must be done on the very next turn, or the right to do so is lost. Such a move is the only occasion in chess in which a piece captures but does not move to the square of the captured piece. If an en passant capture is the only legal move available, it must be made. En passant capture is a common theme in chess compositions. Btw, Chess Online 5.1 is not compatible with earlier versions. Please update. En passant is a special capture made immediately after a player moves a pawn two squares forward from its starting position, and an opposing pawn could have captured it as if it had moved only one square forward. In this situation, the opposing pawn may capture the pawn as if taking it “as it passes” through the first square. The resulting position is the same as if the pawn had only moved one square forward and the opposing pawn had captured normally. The en passant capture must be done on the very next turn, or the right to do so is lost. Such a move is the only occasion in chess in which a piece captures but does not move to the square of the captured piece (Burgess 2000:463). 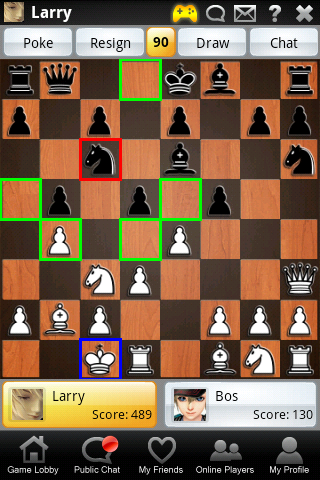 If an en passant capture is the only legal move available, it must be made. 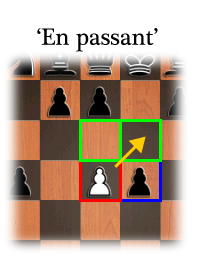 En passant capture is a common theme in chess compositions. With the new UI, users can select a piece first. 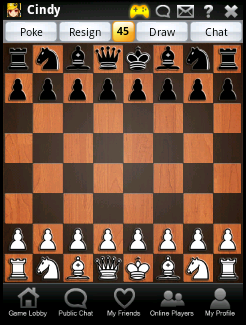 The game then displays all the possible moves from the selected piece. The users can then select a location to move to. See in-game help for more details. Just for comparison, this is the old UI where users had to drag-n-drop a piece. There were no possible moving locations displayed either. 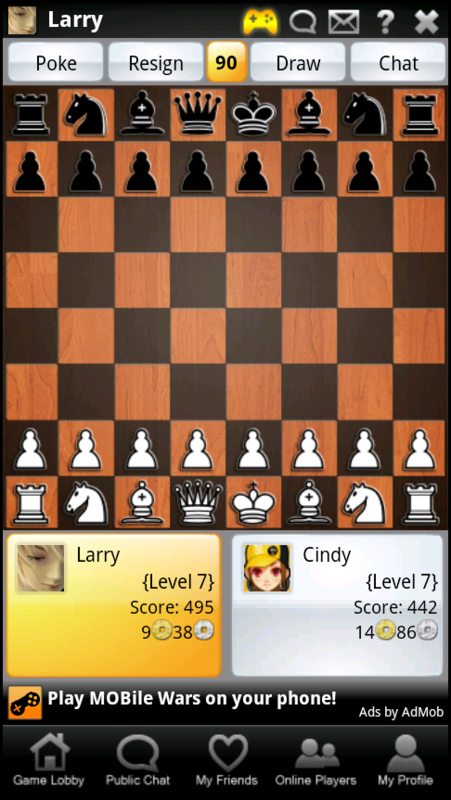 You need to UNZIP the file, extract chess.apk and copy it to your phone’s SD card. Open the file in your phone (you can use any file manage software such as ASTRO) and install it. You might want to uninstall the old version before installing this one. You should be able to play now. If you have any problems please let me know. I will post more pictures later. Need some sleep now…been working over 20 hrs.